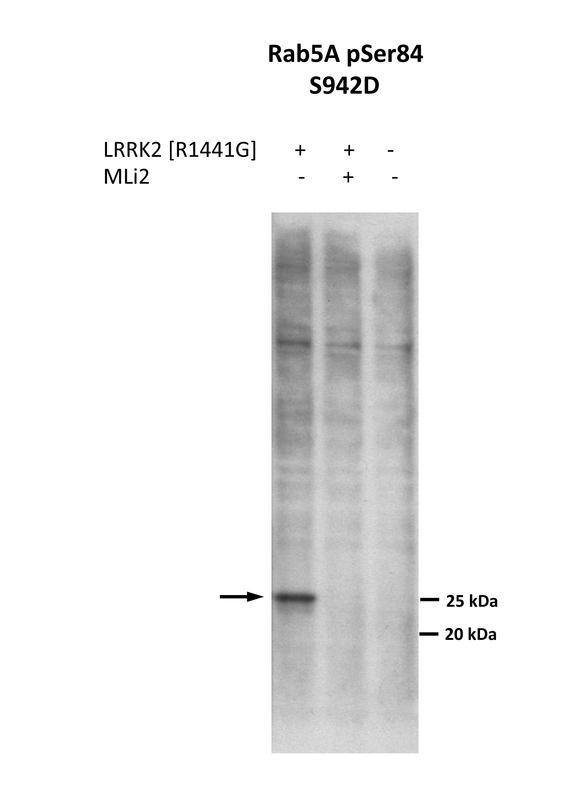 HEK293 LRRK2 [R1441G] FlpIn cells were transfected with pCMV5 HA-Rab5A and after 24 h of incubation expression of LRRK2 [R1441G] was induced using tetracycline (TET). After 24 h the cells were treated for 90 minutes with 100 nM MLi2 (Lrrk2 inhibitor) before lysis. 20 ug of the lysates was for SDS-PAGE and blotting. The antibodies were used in 5% milk in TBST at 1 ug/ml and 10 ug/ml of corresponding non-phospho peptide. The membranes were incubated with the antibodies overnight in 4°C. The secondary sheep antibody conjugated with HRP was used in 5% milk in TBST for 1 hour at RT.